Verizon's Coverage Map - November 2014. That's a lot of LTE! This week marks the 4th anniversary of the December 2010 initial public deployment of Verizon's LTE network - the first large scale 4G/LTE network in the world. What a four years it has been! LTE has gone on to become the global standard for cellular data communication, blowing away the speeds of older 3G networks. With LTE, cellular speeds have begun to rival the speeds of even home cable and DSL connections - and LTE technology is getting faster and more capable all the time. Four years ago LTE on Verizon was limited to a single 700Mz frequency band in 39 cities and 60 airports, and only two USB modems (and no phones) were supported. 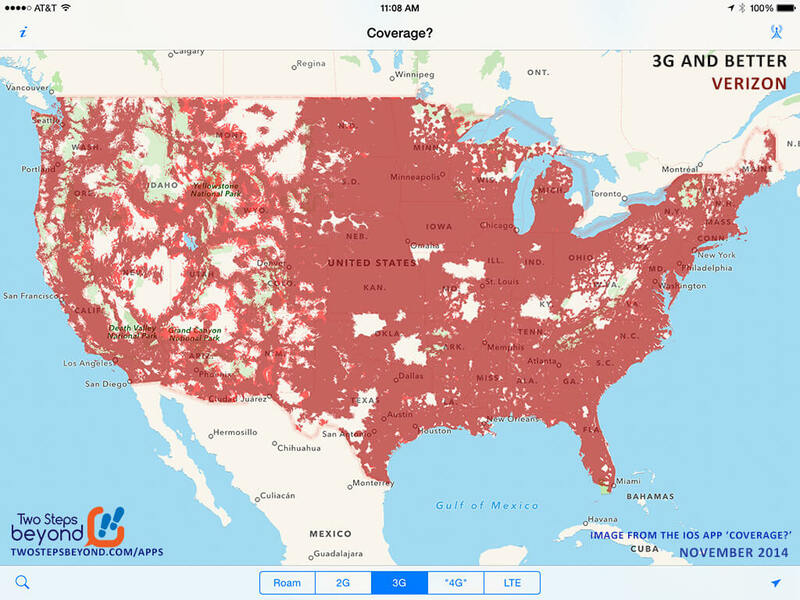 Now essentially all of Verizon's coverage map has been enhanced with LTE support, and Verizon only sells LTE compatible gear. Verizon may have paved the way, but AT&T has been hot on Verizon's tail in rolling out LTE nationwide. T-Mobile, Sprint, and even regional and prepaid carriers are all also upgrading their networks rapidly to support LTE now too. LTE is even an international standard - and has been taking world by storm, with LTE networks now live all around the world. But though LTE is an international standard - every carrier controls different chunks of wireless spectrum, and there are currently 44 different defined LTE frequency bands. No device can support them all - but some (like the 20-band iPhone 6) are cramming an amazing amount of radio capability into a single device. It all started four years ago - we sure have come a long way since then! To make room for more LTE users (and more data consumption), carriers are desperate to expand their LTE networks. Verizon started with the 700MHz LTE band 13, but for more capacity started deploying LTE onto the 1700MHz / 2100MHz AWS frequencies (LTE band 4) under the "XLTE" label towards the end of 2013. Now Verizon has actually begun the long migration of actually turning off its existing 3G network to migrate the 1900MHz PCS frequencies from 3G EV-DO to LTE, offering a third band of LTE service on LTE band 2. Network spotters have discovered that Verizon has shut down half of it's 3G capacity in New York City, and is testing LTE on those frequencies. Many more cities will make the jump in 2015 - and Verizon has made clear that they plan to eventually shut down 3G entirely. For users with LTE band 2 compatible devices, this means more speed and capacity is coming. But for those still relying on Verizon 3G, that means speeds and signal quality is about to begin a long slow slide towards nothing. Eventually even Verizon's 850MHz 2G and voice network will be shut down and migrated to LTE band 5 - but that change is still years away, waiting for voice over LTE (VoLTE) to become pervasive. Tip for Verizon customers: To make sure that your tech can take advantage of Verizon's expanding LTE rollout, look for support for VoLTE, and LTE frequency bands 2, 4, and 13! Verizon this week released an infographic showing off their "4G LTE Journey". We normally wouldn't republish something like this, but... they've earned a bit of leeway to trumpet their own horn.